Sample the Total Charleston Experience. "Come and stay in an elegant Victorian House where time has stood still. A place where history happily coexists with modern life." Elegant Charleston House in Downtown Historic District. This century old house with rare, decorative Italianate architecture and beautiful ceiling moldings was originally the Brodie-Pinkussohn House. All rooms have mahogany and oak fireplaces, 12' tall ceilings, hardwood floors, 10' doors and windows, and lots of Antiques. 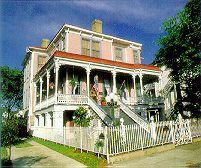 The bed and breakfast has a lovely round porch with rocking chairs and joggling board, overlook the Park and Roman Columns, the remains of the Confederate Soldiers Reunion Hall. Relaxed atmosphere, AC, Private Baths, Parking, TV's. Lovely formal dining room with refreshments, Continental Plus" breakfast. A 5 - 20 minute walk to all Historic Sights and lots of help! "Create your own romantic corner on the 120-foot round porch with a bottle of wine and a loaf of French bread; feel the history around you!" "Relaxed Romantic atmosphere, vintage tastes of the 19th century."